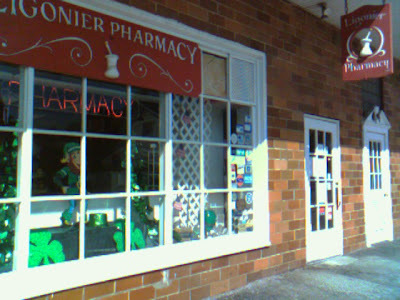 Ligonier Living: I love the Ligonier Pharmacy. I love the Ligonier Pharmacy. If you want personal service and an old fashioned style, make this your stop for prescriptions and over the counter remedies. Anne Coyne, the owner and pharmacist, also has a nice selection of greeting cards and little bags of what used to be penny candy. She sells the little bags two for a dollar. I just munched on a caramel and it was nice and fresh. I noticed when leaving that she also carries Whitman Samplers. I tried to find one of those recently at Giant Eagle. I never thought of the Ligonier Pharmacy, but I sure WILL next time. I love Ligonier Pharmacy and the ladies that work there! You know, I just stopped in to look for an unusual product and they had it! I really like this store. I like the candy. I like the greeting cards. I like the unusual selection of products.